Former World Time Trial Champion and 2008 Olympic Silver medal winner Emma Pooley maintained her status as the current 'Queen of Zofingen', with a third consecutive ITU Powerman Long Distance Duathlon World Championship title in the Swiss town today. Added to the Ironman 70.3 victory of Holly Lawrence, it's been quite a day. Practically a local, having studied and worked in Zurich for so long, the multi-talented Pooley dominated this race for a third consecutive season. Covering the opening 10km run in conjunction with Switzerland's Nina Brenn, Pooley's weapon in this race is the 150km bike leg. Her 4:11:41 bike split over the three lap hilly course which perfectly suits her skills, put her a huge margin of 16 minutes clear at T2. With a closing, primarily off-road and challenging run of 30km to complete the race, such a lead is never a formality. Looking serene over the opening 15km out-and-back loop, Pooley gave up just 90 seconds of her lead heading out on to the final lap. Things got a lot tougher over the closing kilometres though and at times Pooley was reduced to a walk on the steep up hills, ensuring she took in sufficient fuel at the feed stations and managing her effort. While Brenn was able to reduce the gap, Pooley was able to maintain control and come home with an 11 minute victory margin, managing to laugh post-race about her 'walk of shame'! 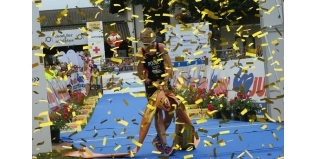 Seppe Odeyn became the fifth Belgian male athlete to take the Zofingen crown, moving up one place from Silver 12 months ago. He was able to pull away from Felix Köhler (GER) on the final run and cross the line five minutes clear of the German, with Søren Bystrup (DEN) repeating his Bronze medal from 2015.